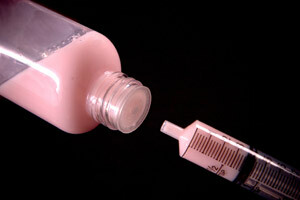 1) Remove the screw-cap and Press a SealSafe® adapter in the neck of the bottle. 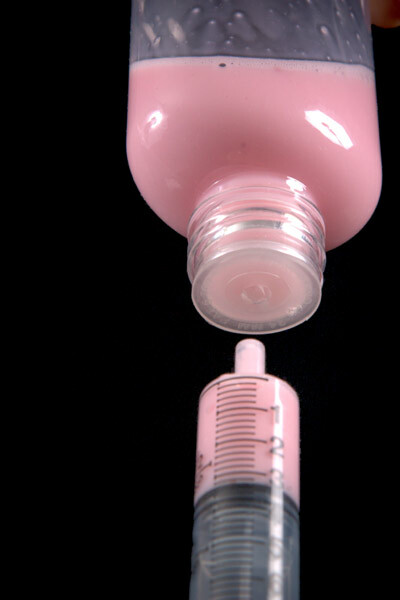 2) Insert the tip of an oral syringe into the SealSafe® adapter, turn the bottle upside-down and draw the desired dosage¹. 3) The SealSafe® adapter reseals after the tip is removed. Replace the screw-cap back onto the bottle over the secure dosing adapter for storage. Clean the syringe thoroughly between uses to remove any residue. Warning: Small parts. This product is not a toy. Keep out of reach of children. Choking hazard. ¹Medications should only be dosed/dispensed according to manufacturer’s and /or medical provider’s printed guidelines. SealSafe® adapters should be tested for use with specific containers, liquids and oral syringe tips to confirm fit and compatibility and to ensure optimal performance. The Andwin Corp. shall not be liable for any consequential damages, loss of liquids, loss of or damage to property or claims of third parties arising out of or in connection with use of SealSafe® adapters. Penetrex® and SealSafe® are trademarks of the Andwin Corporation. SealSafe Self-Sealing Dosing Adapters are protected by patents and patents pending. Patents: US 6,752,965 B2, US 6,361,744 B1 and US 6,030,582.